We often take for granted just how much time and effort it takes to bring a beer from its constituent parts to a finished product. We grow and harvest our hops and grains, prepare and transport them… and that’s just to get them into the hands of a brewer. From there, if the brewer can work magic, we’ve still got weeks of tending and maturation before we’re even close to a finished product. Maybe even months. And when the product is complete, it’s still got to be packaged, shipped and stored properly before it’s ready to be sold. In total, we’re looking at many months, if not years of time and effort put into every beer. With this in mind, there is simply too much at stake not to place a premium on how a beer is served, and how this knowledge is shared with your customers. In this article, we will discuss some ways in which your establishment might improve its customer service, and the rewards it will bring to your business. Let’s start with the product itself. Do your servers have the knowledge they need to properly serve each beer you offer? Are they aware that some beers are ideally served at varying temperature ranges? Furthermore, is your establishment equipped to offer the variety of service required for different beer styles? Do you stock a range of glassware, or simply pint glasses? If you’re selling light lager, you might not need to concern yourself with details beyond keeping the beer frosty and filling that pint glass. But by making the relatively small investment of offering multiple kinds of glassware and maintaining it, you will have already begun to cultivate a customer base that is willing to pay more, often for smaller quantities. The same logic goes for educating your employees. If you’re willing to make that small, one-time investment, you’ll see lasting returns. Servers will now pass on their deepened appreciation and enthusiasm to the customer. From here, it’s only going to snowball. Think about it – if you begin building enthusiasm for craft beer within your customers, you’ve become more than a bar or restaurant, you’re now a destination for exploration. If you attract customers who understand why a beer like Tripel Karmeliet is coveted and you manage to get your hands on some, you’ve separated yourself from the herd, and have elevated your business in the eyes of the customer. This is precisely the model employed by establishments such as Flying Saucer and World of Beer which has allowed for consistent growth. Employees are trained to cultivate interest and appreciation, and in essence, build and convert non-paying customers into paying customers. If you own a bar or store, and would like our staff to help train your team on our beers, please contact us. We offer no-charge training where permitted by law. It’s a great way to get your employees up to speed on our beers. Education is the foundation for better customer service, but it doesn’t stop there. If your employees take an interest in not only the beer, but the customer, your returns will be further compounded. This starts with the obvious: getting to know your customers. Start getting on a first name basis. If you start building relationships with your customers, you’ll see them more often and they’ll stay longer. They’re going to return, and they’re going to bring friends and family, because they’re comfortable and feel respected in your establishment. They’ll market for you (for free! ), and stick up for you in times of trouble. But wait, there’s more! Strong customer relationships are also an incredible source of unfiltered feedback. They’ll let you know if something could be better, and they’ll happily tell you what they think about the new sour you’ve got on tap. If you and your employees strive to get to know each customer, your business will thrive. You’ll also know exactly what your customers like, which you can then provide and even build on. After all, there’s power in the recommendation. “You love Blue Moon? Why not try St-Feuillien Grisette Blanch?” This is a win-win. You’ve now turned them on to a higher margin product, while also expanding their horizons and providing a new experience. However, this scenario is only likely to succeed if you’ve built a foundation of trust. Once again, a company culture of relationship building between employee and customer can only be beneficial. This foundation of trust can offer other opportunities to build relationships with customers, and ultimately, your business. Think Beer Clubs and “achievements” i.e. logging their beer purchases and offering rewards for certain milestones. Customers have another reason to come back and keep exploring, and you find out exactly what they like! Customer service doesn’t just apply to interaction with employees. The environment and atmosphere you create is also incredibly important, and should align with the identity of your business, employees and customers. Is the music fitting? Is the lighting appropriate? Is the seating comfortable enough to allow for extended visits? Are the walls barren? 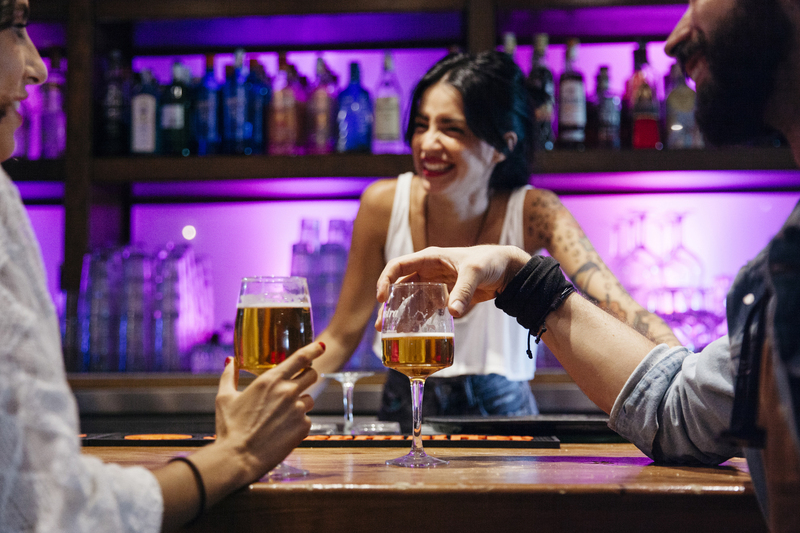 Every element of your facility should encourage comfort for the customer, and foster an atmosphere which allows for letting one’s guard down and enjoying a pint or three. If this is not the case, you’re working against yourself! A consistent theme of any relationship, be it owner to employee, business to consumer and so on, is that they must be mutually beneficial. You have to be willing to give in order to get something in return. And obviously, the more you give the more you will get. This philosophy could be applied as simply as offering rewards programs or samples to your customers. On a slightly larger scale, it may take the form of an extra day of paid vacation for your employees, or high-quality, comfortable and stylish uniforms. Sure, these options cost money, but the return will take the form of happier, more enthusiastic employees whose sense of duty and pride in their work goes beyond just a paycheck. Customers will pick up on this as well, and comfort levels across the board will increase. That’s a better environment for sales. Ultimately, while the business owner makes the decisions, perceptions of a company often come down to customer service. Fostering an environment of comfort and trust in both employees and customers will ensure your business is viewed favorably by all, and sees lasting success. Willingness to give, whether it be time, information, or resources, will more than likely bring you lasting returns. When customers feel they are seen as people and not dollar signs, they’ll invest their time and money back into your business.